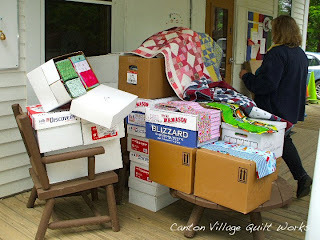 Canton Village Quilt Works | Hole In The Wall Gang Call Out!! Hole In The Wall Gang Call Out!! I know that some of you remember my call out last year for the Hole in the Wall Gang Camp. Well, it is that time again. 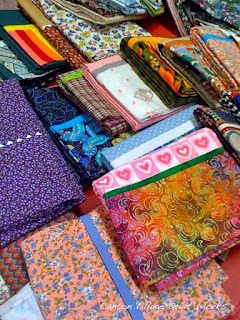 I have had some e-mails and inquiries about when I would be calling out for pillowcases again. The time has begun!! 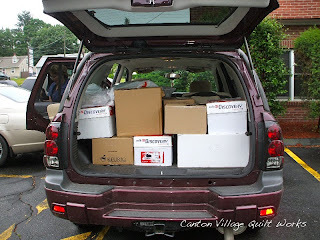 The car packed with boxes ready to travel. Boxes arrived safe and sound! More arrived, plus some help. 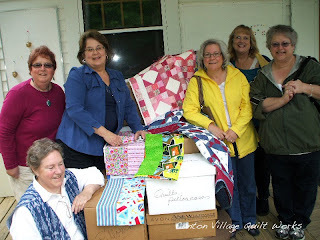 The ladies of our guild and staff from the camp happy for the pillowcases and quilts received for the kids. 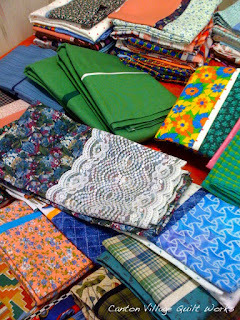 So this year has already begun and we have a nice start on the pillowcases. We currently have over 200. Here are a few photos that I took with my iPhone at the guild meeting. 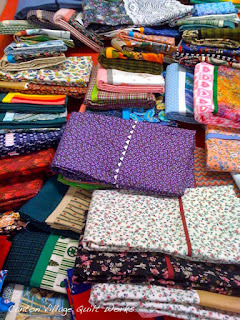 A lot of the fabric had been donated by the ladies and some fabric companies are also sending us fabric. Many are making the cases and just sending them to us. I can't begin to tell you how much these pillowcases are appreciated by the children. This is one thing they get to take home with them at the end of camp. You can read more about the camp by clicking HERE. If you would like to make some pillowcases, you can find a quick and easy pattern PDF listed on my sidebar under "Freebie Patterns". 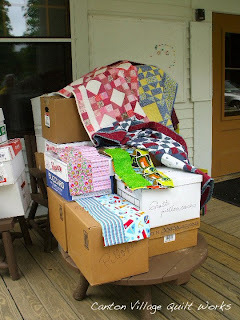 Then send me an e-mail cantonvillagequiltworks@comcast.net or comment on this post and I will send you my address to send the pillowcases. 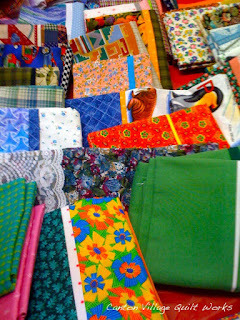 We will accept your pillowcase donations through April, 2010. It truly is a wonderful cause putting a smile on these children's faces. Thank you in advance for your generosity and kindness. In other news, check out my Etsy Treasury here. See lots of summertime inspiration. But be quick it expires on Tuesday.